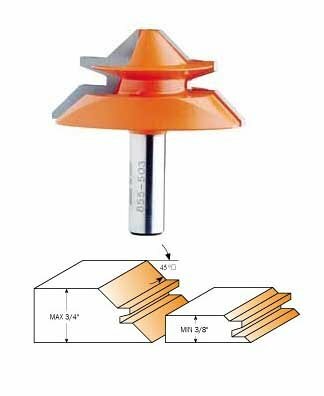 Both the CMT Lock Miter Bit and the new Baby Lock Miter are the perfect tools for any and all your joint projects. Use the Lock Miter for making jewelry boxes, frames and right angle or parallel joints in stock from 5/8 to 1-1/8. For humidors and small jewelry boxes, we made the Baby Lock Miter to make joints in thinner stock - from 3/8 to 3/4. To produce perfectly fitting miter joints, mill the piece with the inside face flat on the table centered to the bit as shown in step 1 below. Mill the other work piece with the inside face vertical to the bit and fence, as shown in step 2 below. For sturdy parallel joints follow step 1. Lay the other work piece inside face up and mill.